Within the past, oh...6 months or so I've had an influx of messages from new and beginner knitters (and even some experienced knitters too) asking me about my needles. What needles do I use? What brand do I recommend? 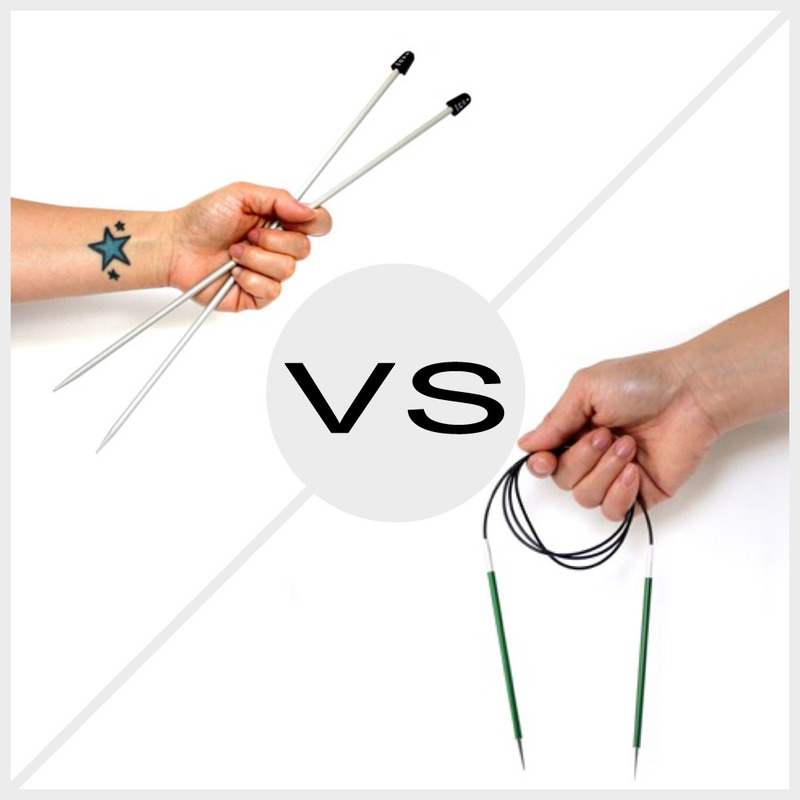 Should a knitter use just straight or circular needles? Why don't you ever see me knitting with straight needles? Well, like most things regarding knitting, it all comes down to personal preference. I had started out using nothing but straight needles, as that's what I was accustomed to and what I had always thought was considered knitting. You know how it is, even nowadays, growing up anything pertaining to knitting always showed a ball of yarn or a machine-wound skein with either wooden or grey metal needles sticking out of it. Seeing someone knit on TV or in the movies is rare, but when it happens I'm sometimes surprised if they are doing it right (as in needles down and not held like rabbit ears). As a child, seeing someone knit with straight needles sticking up in the air all TV antennae-like is what I thought knitting was all about. When I was taught to knit I was given straight needles. Throughout my "dabbling years" (the years where I had dabbled in knitting and had knit stuff but didn't call myself a knitter), I used nothing but straights and DPNs. I had no idea what circular needles were about and truthfully, was extremely intimidated by them. It wasn't until fashion school that I dared to try using them (I kind of had to, it was for a project! ), but after that, I went back to the safety of DPNs. Then I moved to Victoria. After attending a few knit nights with the Bitchy Bees, I saw that pretty much everyone was knitting with circular needles. Even for flat items! FTW?!? I asked questions galore about the circulars and what the deal was with them. Then I ventured out to my LYS and bought a pair to try out in my next project. That's when the magic happened and my knitting took off. Since that moment I've stopped using straight needles and started using circular needles exclusively. I'm even a Magic Looper. I will only use straight needles if the pattern calls for obscenely large needles (like a 19mm) and I don't have the size in my arsenal of circular needles. Even then, the second the chance arises to switch back to circulars, I do. On the double! I'm sure I'm missing a few more points up there but I really can't think properly today (thanks allergies!). Basically, I'm a fan of using circular needles and that's what I use. You should knit with what you like and are comfortable with using. As for what needle brands I recommend? Obviously I really can't recommend anything involving straight needles since I don't knit with them, but I do have some favourites when it comes to what circular needles I like and use. But due to time, my allergies, and the fact that this post is already longer than I intended it to be, I'm going to break it down. The next 4 blog posts (yes, four!) will be all about the needles I own and use. A little review, if you will. Any guesses as to what needles are my favourite? What are yours? Are you a fan of circulars too? Or are you a traditionalist? In the meantime, I've got a date with some antihistamines and a neti pot. See you at the next blog post!